Ford’s smallest SUV, the compact EcoSport, has a large list of available interior features. Inside, you’ll find everything from a versatile cargo area with folding rear seats, to the latest, touchscreen infotainment system. The well-appointed cabin is a great place to be – even when you’re stuck in traffic. The five-passenger cabin of the EcoSport has everything you and your loved ones need. Four trim levels are offered on the 2019 model: S, SE, SES and Titanium. 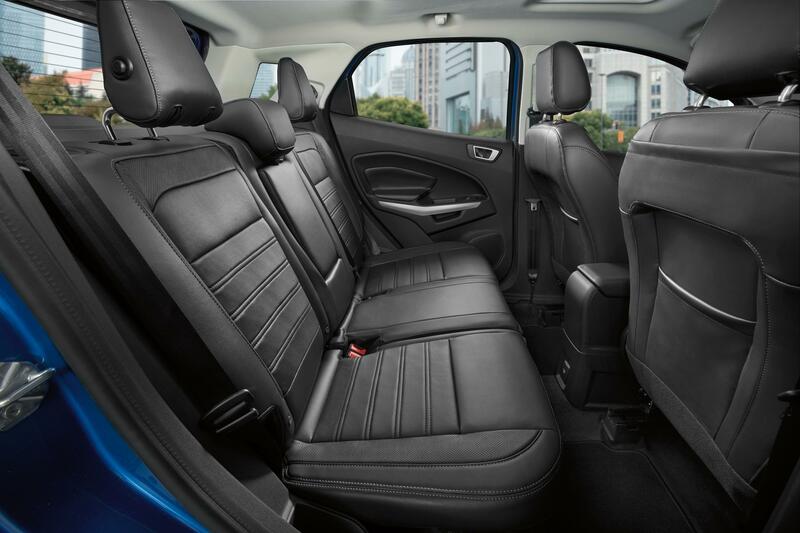 Even the base S model has a spacious, nicely furnished interior. And the standard features only get more generous while moving up the list towards the top-tier Titanium. There’s room for everything – and everyone – inside the 2019 Ford EcoSport. A hatchback-style roofline allows up to five passengers to fit comfortably inside the cabin. Front-row occupants get a generous 42.9-inches of legroom, while those in the back receive a healthy 36.7-inches of space. Everyone enjoys ergonomically-designed seats covered in soft-touch upholstery. seats can fold flat. A handy Cargo Management System, with adjustable rear load floor and removable shelf, also comes standard. All Ford EcoSport models, including the base S trim, come with a heaping helping of standard interior features. Occupants get a rearview camera, cruise control, a tilt-and-telescoping steering wheel and adjustable front seats. Tech goodies, such as a 4.2-inch touchscreen display with Bluetooth, are also within reach. Upgrading to the SE model adorns the EcoSport with even more interior amenities. Highlights include a sunroof, keyless entry and ignition, automatic climate control, heated front seats and a power driver’s seat. The infotainment display gets a more substantial, 6.5-inch screen and the SYNC3 operating system with integrated Apple CarPlay and Android Auto. Those looking for extra indulgence can opt for the available Convenience package. The bundle adds blind-spot monitoring, ambient interior lighting, a larger touchscreen display, Wi-Fi and a 110-volt power outlet. Moving up to the SES nets you all the contents found in the Convenience package, plus an auto-dimming rearview mirror, a heated steering wheel and leather-trimmed upholstery. Finally, at the top of the list, there’s the luxurious Titanium with its full-leather upholstery and B&O Premium audio system. Naturally, the top-of-the-line model also comes with everything found on lower trim levels, along with the equipment from the Convenience package. Also, worth noting: EcoSport SE, SES and Titanium models are offered with an available Cold Weather Package. Winter-fighting equipment, such as a heated windshield wiper de-icer and floor liners, are included. A full range of Ford SUVs – including the versatile 2019 Ford Escape – are available now at your local Southern California Ford Dealers. Stop by today for an incredible deal on a class-leading vehicle. Meta: The 2019 Ford EcoSport offers a five-passenger cabin stocked with the latest features. Check out this versatile compact SUV now, at your local Southern California Ford Dealers.